It's 2006 in the Manhattan of the young and privileged, and a new generation of heirs and strivers are jockeying for social power and discovering that class, especially on the Upper East Side, still holds sway. At 26, Evelyn Beegan is the product of new money, propelled by her social-climbing mother through an elite prep school, a posh college, and into Manhattan. Evelyn has always managed to stay just on the periphery of this world her mother so desperately wants her to become a part of. But when she takes a job at a new social networking site aimed at her very elite peers, she's forced to leverage her few connections to work her way to the front of the pack. With the help of her prep school friends, Evelyn goes from lush "camps" in the Adirondacks and "cottages" in Newport, to Southampton weekends and clubs thick with socialites and Wall Street types, eventually befriending target #1, Camilla Rutherford--a young woman who is a regular on the front page of every society blog. In order to be accepted by this rarefied set, Evelyn must be seen as someone with established old money. Her lies start small, but quickly grow, and as she relentlessly elbows her way up the social ladder, the ground underneath her begins to give way. The first third of the book I was not sure what the author was going to tell. I needed some time to get Evelyn. Maybe, for me as an European, this book is too American for me. But after a while I got it. Evelyn leads a normal life in New York. Her parents are not really rich, but there is some money. Her mother, Barbara, always wanted something better. If not for her, then for her daughter. But Evelyn knows that there is a difference between Old Money and New Money. But nevertheless she tried to keep up to her mothers expectations and she is waiting for her real life to start. She works for a social media website which wants the socialite kids as members. Somehow this is the trigger. Evelyn becomes friend with a socialite girl, Camilla. She fakes herself into that circle by lying about herself and her background. And this is the point where everything begins falling apart and Evelyn totally lost control. She gets absolutely absorb by this luxury lifestyle. She finally feels like she is there where she belongs. This was the part I had some problems with. Evelyn was a quite normal, reasonable until then, but suddenly she got kind of crazy. She keeps on buying thins, doing manicures, yoga classes, dinners, just putting out one of her credit card. She ignores the incoming bills, even stops paying rent. She is furious at her parents, her father, for not supporting her with more money. When she lost her job, she is quite happy about this because this stupid job is holding her back from her “real” life, her social life. Now she finally can do her cardio class at eleven a.m. Evelyn completely lost her feeling for reality. She upsets her old friends, and is cheating on her boyfriend because she is in need of money and a wealthy socialite husband would be nice. I did not like Evelyn. I could not really see why she suddenly fell so deeply into the spell of this hollow socialite living. Camilla is demanding, manipulative but Evelyn is all over her because she the top member of high society. In flashbacks we can see that Evelyn has some issues with her mother, who pressed too many expectations into her and what she should demand from life. These issues could have been written a little bit more specific. So I quite enjoyed her downfall lately. What all began with little white lies, a little bit readjusting her own family background, falls apart when Camilla lost interest in her and humiliates her in public. 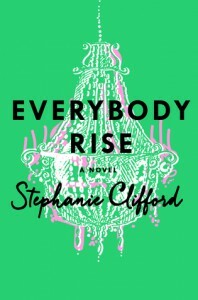 “Everybody rise” was an easy read. At the start I was not sure where the story will lead, but then I felt kind of schadenfreude how Evelyn made a fool of herself. I cannot imagine this could be happening to a real person. For me it is an absolute absurd story. Maybe just because I don’t know anything about those wealthy kids hopping between their Adirondack Camps, their summer retreads in the Hamptons and their New York Lofts. Though, I enjoyed it most of the time. The writing was ok, sometimes the author uses too much of this Sonderheim music thing. The beginning is quite slow, but I must say the author just established the setting. The characters are all quite flat. None of them got a really good background. They all are only there to support the main character. I would have been very interested what was going on with Preston, but the focus is only on Evelyn. So this was not a bad read, it was quite interesting. I enjoyed it, but it won’t make it to my top reading list for this year.